Ninety-two-year-old Johanna beams at the 20-year-old stepping into her room -- not a visiting grandson, but rather a housemate at her retirement home. Town planning student Jurrien is one of six who have chosen to live in the yellow-brick home in Deventer in the eastern Netherlands as part of a unique project that benefits everyone. The university students pay no rent and in exchange spend at least 30 hours a month with some of the 160 elderly who live here, doing the things professional staff cannot always do -- such as just hanging out. "They go see the pensioners for a chat, they play games, go with them to the shopping mall, (and) do shopping for those who can't," says activity coordinator Arjen Meihuizen. Gea Sijpkes, the head of the Humanitas retirement home, said: "It's important not to isolate the elderly from the outside world." "When you're 96 years old with a knee problem, well, the knee isn't going to get any better, the doctors can't do much," Sijpkes said. "But what we can do is create an environment where you forget about the painful knee." While retirement homes in many European countries lack enough rooms for an ageing population, budget cuts by the Dutch government have made it increasingly difficult to get a subsidized place, leaving some with more rooms than they can fill. The sharing idea has resonated in a country where many people do volunteer work, and other retirement homes are coming up with their own variations on the theme. 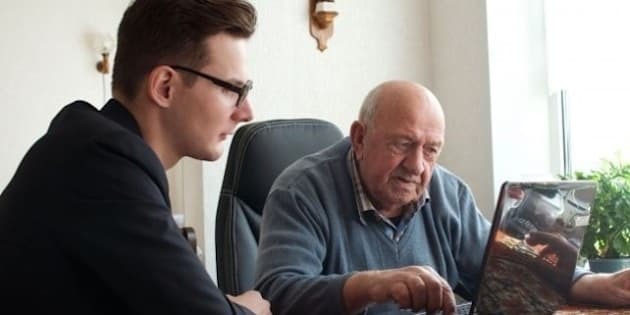 So-called "intergenerational" projects are also springing up elsewhere in Europe, but usually not within retirement homes because of the shortage of rooms. In some schemes, the elderly rent out a room in their own house or apartment, in others, housing projects are built specifically to house the young with the elderly. In the French city Lyon, a project was set up for students to pay rent to live in a retirement home, but the rules are strict and, unlike in Deventer, friends are not allowed to visit. In Britain, a commission chaired by a former minister recommended in September that new housing for the elderly and disabled should be incorporated into shopping developments, new apartment blocks and even universities to prevent the elderly from being cut off in "care ghettoes". "The old model saw care homes as isolated institutions where things were done to you rather than for you and were islands of misery," said former care minister Paul Burstow. "Care homes that are cut off from their communities aren't real homes." The students in Deventer prepare simple meals for some of the elderly in the evening and offer them activities according to their interests. Student Jordi, for instance, took a group into the garden and gave them cans of paint to spray on cardboard so they could learn about graffiti. Jurrien gives weekly computer lessons to Anton Groot Koerkamp, 85. "Now I can send emails, go on the Internet, look up videos and go on Facebook," he said proudly. There is no obligation for the elderly to take part in activities with the students. But many, like Jurrien's neighbour Johanna, seem happy with the arrangement. "I'm old, he's young, but we get along well," she said. "We do small things, not much really, but it can help put them in a good mood," said Jurrien. "Not only do I not pay any rent, but I also like working with the elderly," said journalism student Denise, 22. "Given that student rooms are too small, too dirty and too expensive, this is a fantastic alternative." "For 400 euros ($500) I'd get barely 10 square metres (100 square feet) and I'd have to share the kitchen and bathroom," Jurrien said. "Here I have twice as much space and I have my own kitchen and bathroom." The students can have friends over for drinks and even have a partner over for the night. There is no curfew or other restriction as long as the students are reasonable. "One time I came back in the middle of the night and I woke my neighbour (Johanna), she wasn't very happy," said Jurrien. "So, being a good neighbour I went and apologized and promised not to do it again." Then again, Jurrien said, smiling: "When she watches (Dutch television game show) 'Lingo', I can hear everything through the wall."